Creation: Appeared in July 1933 as a renumbering of VA 23. Ran as it does today, plus continued north through Blacksburg, Pearisburg and Narrows before entering West Virginia at Glen Lynn. This is the 2nd VA 8. 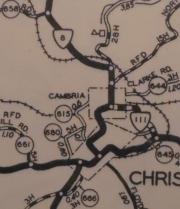 Adjustments: In March 1934 (CTB), VA 8 was removed from Giles Rd in Northern Blacksburg leaving behind SR 683. About 1935, VA 8 was rerouted in Christiansburg to follow today's US 460 Business north out of town. Initially, it used Depot St over to Cambria, then followed VA 111 northwest. Depot St has been unnumbered since, while the rest became an extended VA 111. About 1936, VA 8 north was truncated to Rich Creek, replaced by the new US 219 (now US 460, SR 12xx in Glen Lynn and SR 806 in Rich Creek). VA 8 now ended at the current US 219 jct with Main St. In Oct 1939 (CTB), VA 8 was rerouted in southern Blacksburg to use current US 460 Business. Originally, VA 8 used Airport Rd which is no longer continuous. In 1941, VA 8 north was truncated to across the New River from Narrows. 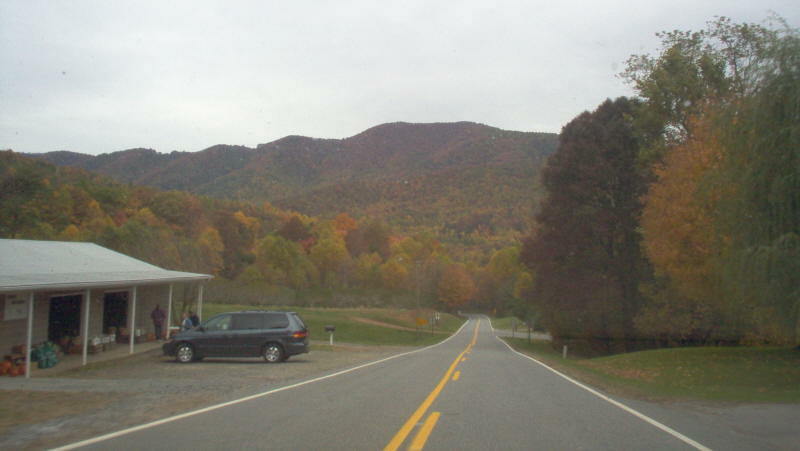 Narrows to Rich Creek became part of an extended VA 100 (now part of US 460 and SR 806 in Rich Creek). Between 1937-43, VA 8 was removed from College St in Christiansburg and placed on its current Main St routing, leaving behind SR 692. 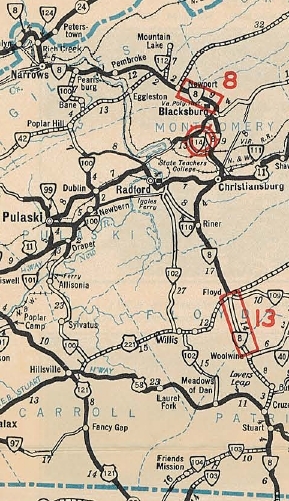 In 1947, VA 8 north was truncated to its current ending in Christiansburg, replaced by US 460 from Christiansburg to Pearisburg; VA 100 from Pearisburg to Narrows; VA 61 across the New River from Narrows (this bridge was just to south of current bridge). Today, in addition to 460, this is US 460 Business from Christiansburg through Blacksburg; abandoned alignments over Walker Mtn; SR 79x and VA 42 to Newport; SR 798; SR 783 through Maybrook; SRs 777-778 in the Sinking Creek area; SR 771 at Hoges Chapel; SR 1404 through Pembroke; SR 636 in Ripplemead; US 460 Bus in Pearisburg. In 1980, 1985, and 1989, VA 8 was rebuilt in northern Floyd County, leaving behind several SR loops. In 2014 or 2015, VA 8 was placed on a bypass of Stuart which was partial new construction on Wood Brothers Dr west of downtown. The old route through central Stuart became VA 8. 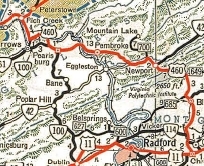 The rest of VA 8 was paved in 1936. VA 8 has no multilane segments. Posted: Fully posted; cutouts remain in Christiansburg in 2009; white border VA 8 shield at US 11 SB still up in 2009. 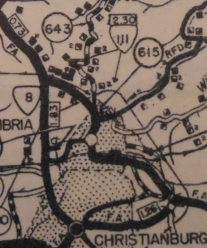 The 1943 Montgomery County map shows this as US 8 through Riner. More specifically, VA 8 began at Mathews CH, then followed VA 198 to Cobbs Creek, then VA 3 northwest. At the Piankatank River, VA 8 used Mathews SR 701 and Middlesex SR 655. VA 8 picked up VA 33 west, likely using the SR 638 loop at Christchurch. At VA 227, VA 8 used SR 641 to SR 629 back to VA 33 into Saluda. VA 8 picked up US 17 Bus and US 17 north from Saluda, then used SR 614 in the Warner area. After more 17, VA 8 used SR 695 in the Church View area. VA 8 the used US 17 to Jamaica, then SR 647. A bit more 17 was followed by SR 608 Glebe Landing Rd. 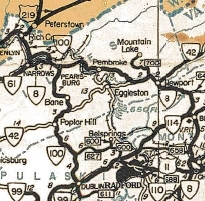 In Essex County, VA 8 followed SR 720 from Laneview to Montague; SR 602 from Montague to Oakley, then across US 17 and still on SR 602 looping over to Center Cross. After a bit of US 17, VA 8 used SR 718 then crossed US 17 onto another loop that is no longer a road; a little more 17 to Ozeana; then looped back and forth with US 17 without using it all the way to SR 609 past Dunnsville (SR 1103/1102/1001 loops and some that are no longer roads); VA 8 used a bit more of 17 then used an alignment slightly west to cross Piscataway Creek; then used "Old Seventeen" and SR 715 to Brays Fork. VA 8 used US 17-360 into Tappahannock (except it used SR 698 loop and SR 1003). VA 8 then followed SR 657 west which no longer connects to SR 627. VA 8 used SR 627 then SR 716 back to US 17, then the SR 624 loop in Caret. 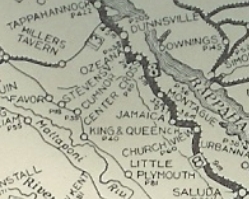 The 1922 Auto Trails map shows VA 8 using SR 624 to Lloyds, then SR 631 to Champlain, then an SR 11xx loop, then a little SR 633 over towards Occupacia. VA 8 may have used SR 632 and SR 658 which no longer connects back to US 17 at Loretto. VA 8 then used US 17 to the Caroline County line except the bridge over portobago Creek is to the north a little (but still there). VA 8 seems to have followed US 17 to Port Royal (using the NB alignment where the route splits). VA 8 used the still visible old bridge to the north of US 17 over Goldenvale Creek. 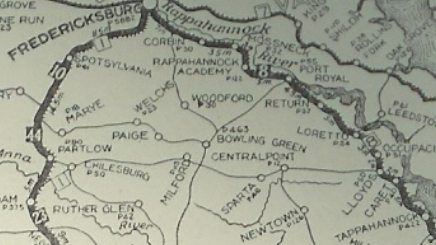 The 1922 Auto Trails suggests that after Rappahannock Academy, then used SR 719 north to (no longer connects to) SR 614 then back to US 17 to New Post. VA 8 then used SR 698 which no longer connects back to US 17 Bus but the two old bridges at Ruffins Pond are visible to the north of US 17 Bus. VA 8 followed 17 Bus generally to SR 638, then likely used Old Airport Rd to head towards Fredericksburg, which used to connect with Dixon St. VA 8 then turned onto Princess Anne St and the route ended at VA 1 National Rd (now Lafayette Blvd). In Dec 1921 (CTB), VA 8 east was truncated to end at VA 9 (now VA 33) Saluda. most of the Saluda to Mathews route became non-primary at that time, with Mathews CH being served by VA 9 SPUR #3 from Gloucester CH. Creation: This VA 8 Business appeared in 2014 or 2015 as a renumbering of VA 8 through central Stuart. Comment: VA 8 Business very closely parallels VA 8 bypass for its first 1/3 of a mile or so.